2018's Biggest Hollywood Film 'The Post' Releases Today! 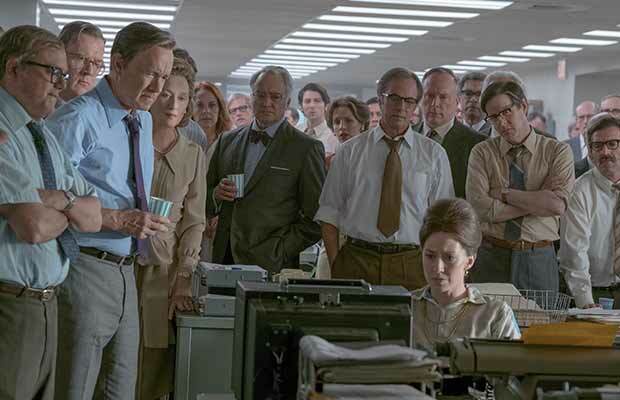 Home HOLLYWOOD 2018’s Biggest Hollywood Film ‘The Post’ Releases Today! This year’s biggest release ‘The Post’ has finally released today. ‘The Post’ had already garnered rave reviews in the USA where the film released a few weeks back. The Post is a film directed by Steven Spielberg and will also bring the best Hollywood actors Meryl Streep and Tom Hanks together for the first time. This in itself makes The Post one of the most awaited and biggest films of 2018. In a recent screening held for the media in Mumbai, the film left everyone enthralled. Also, the film got nominated in 6 different categories for the Golden Globe Awards including nominations for best picture, best director, best actor and best actress. The performances of Tom Hanks and Meryl Streep have been appreciated and loved. The direction of ace filmmaker Steven Spielberg has been applauded and the way the film has been helmed is one of the best things to look forward to in the film. The Post is a thriller film which tells the story of the unlikely partnership of Katharine Graham (Streep), the first female publisher of The Washington Post, and its driven editor Ben Bradlee (Hanks), as they race to catch up with The New York Times to expose a massive cover-up of government secrets that spanned three decades and four US Presidents. Presented by Reliance Entertainment and directed by Steven Spielberg, ‘The Post’ has released today in India. Previous articleAn Insignificant Man Crosses 1 Million Views On Youtube! Next articleBigg Boss 11: A Huge Twist In Winner Announcement!